Power Supplies, Watts New News Releases, Pioneer Magnetics Switching Power Supplies, AC to DC Converters, Power Converters Conversion, Power Regulators, Contract Assembly, Value-Added Manufacturing,Prototyping, Out-source, Power Supplies Repair Services, Electromechanical Design. Green is a great color! The movie industry has used green slime to frighten adults. Kermit the Frog has become a positive icon for children. Editors frequently use green as the “new primary color” on magazine covers and at the same time, advertisers, regardless of the product, find ways to incorporate green into the message. The variety of shades and hues has conjured up a feeling of “life,” a sense of tranquility and, perhaps, best of all, money. More recently, green equates to ecology and efficiency. Industries associated with pollution, chemical run offs and contaminated land, tout “green changes” in corporate philosophies. Corporate CEO’s claim innovated technologies geared to clean the environment and meet new or stricter federal and state standards. Green is now the color of choice! Several years ago, Pioneer Magnetics (a.k.a. “PMI”) recognized that its customers would be looking for innovative ways to reduce costs. Procuring greater material quantities, evolving to LEAN manufacturing techniques, automating and producing product offshore would not be sufficient to meet required cost reduction targets. PMI determined that a redesign of current and future power supplies geared for more efficiency might provide the desired cost reductions as well as meet future green initiatives. 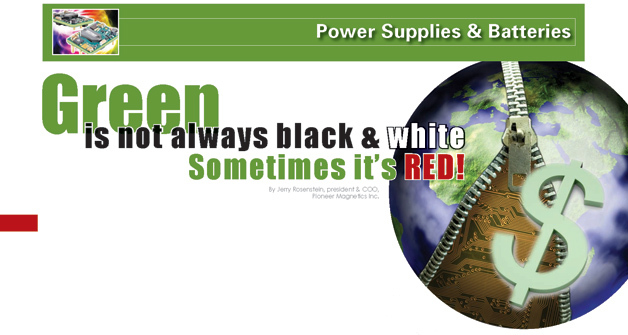 Most high-end switching power supplies have efficiency ratings in the 88% to 90% range. Some power supply companies have struggled to get product efficiencies to 91% or even 92%. Like trying to run that sub four-minute mile or break the sound barrier, each incremental step of efficiency improvement takes a significant amount of time, experimentation, money, energy and perseverance. Eventually, that evasive threshold is crossed. With standards continually evolving, the effort to traverse that > 92% “efficiency barrier” may soon be upon us. Semiconductor manufacturers touted that characteristics such as high breakdown electrical field strength, wider band gaps and higher current densities translated into a “smaller, less expensive and a better quality solution for those power supply companies striving to meet green initiatives, increased efficiencies and lower costs for the end-user.” The “SemiCon” manufacturers even stated that “NextGen” (silicon carbide) semiconductors would not only become the platform for power supplies but for other “green” products as well. So, if the silicon carbide-based components were so attractive, where are the brass bands? Why aren’t the flags waving? Why isn’t there a long line of power supply customers around the block for that “super efficient” power supply? Once again, the “ol’ technical soothsayers” were wrong. Assume that power components represent about 20% of the bill of material cost for a typical switching power supply design. Using a PMI product as a reference, it turns out that for a given family of power supplies having the same power range (wattage), the cost for the silicon carbide power components may be 3X or even > 4X more expensive than the conventional, straight silicon components. And that’s when PMI gets “quantity” quotes from its supplier! Two approaches were used to calculate “cost per watt” – a 40% margin and a “material multiplier.” Interestingly, there is no “industry standard” used to calculate a selling price. Some power supply companies use a margin based on material costs (only), a combination of material and labor costs or, in a few cases, a multiplier against the material cost. There may not be a right or wrong approach. The key, of course, is profitability on a particular program. In any event, it’s clear that the cost of Silicon carbide is a significant factor in pricing out a power supply. Besides the Silicon carbide-based component cost increase, there are other issues. Similar to Gallium arsenide, Silicon carbide has a higher band gap and the forward drop losses (for our industry) are not acceptable if efficiency, size and temperature ratings are critical. “Size” or the overall dimension of a product now comes into play. Not surprisingly, the market is ignoring technical reality with its new efficiency specifications. The end user continues to pressure the power supply manufacturer to reduce the overall dimension of a power supply as well as the cost, in the same breath expects better efficiencies. Unfortunately, there is an inverse relationship between size and efficiency. With improved efficiency, there are indirect temperature issues. More efficient power supplies mean less heat. However, the smaller the power supply, the harder it is to dissipater heat. Therefore, the (indirect) increased temperatures require more heat sinking. More heat sinking requires more aluminum – all of which requires a larger product case to handle the dissipation of heat. Then, there is the frequency issue coming into play. Higher frequencies usually result in smaller magnetic components but the switching losses may reduce efficiency. Therefore, by reducing the frequency, efficiencies may improve but the product will then result in larger magnetic components. To further exasperate the situation, switching causes a loss of “joules” or power. The key, of course, is to minimize cost-increase percentages, finding ways to keep the power supply from growing in size while striving to achieve the required increase fraction of efficiency. In addition, the customer continues to dictate that there is a “time to market” issue. As the “Time To Ship Clock” ticks away, it’s fascinating to see design engineers struggle and then incrementally achieve 91.1%, 91.2%, 91.3…., 92% efficiency levels. Yet, when all is said and done, engineering designs may be compromised unless there is a technological break-through -– that yearning for an “Ah ha!” which every design engineer dreams of finding during his/her career. PMI engineers recently had that “Ah ha” moment while working on a customer’s (new) efficiency requirement. Never ignoring customer’s challenges and working with key component suppliers, PMI’s engineering department went to work using known and unique design approaches with its development of a new power supply a 10 kW (3U) unit that will soon become a platform for a family of 10 kW products. Knowing that higher efficiencies translate into a larger product, PMI engineering determined that choosing the right kind of diode would be critical. Schottkey diodes have some impact in improving efficiencies. Conversely. ORing diodes reduce efficiencies and create many issues when it comes to heat dissipation. However, ORing FETS may turn out to be a better solution for some products resulting in size and cost reduction. Using what is known and trying different design techniques, PMI engineering strove for that extra incremental percent. The end result was that PMI’s engineers developed another approach, which is expected to help the industry “cross the efficiency threshold” resulting in a new standard. One of the integral aspects of the 10 kW design was the use of a different type of power component. It’s anticipated that most of PMI’s newer product lines, which tend to be low voltage-high power and with power ranging from 1000 to 30,000 watts, will soon go through design changes using the new (efficient) technology. Although 100% efficiency may never be achieved, design engineers will find ways to reduce enough switching losses to ultimately yield a real 94%. Will efficiencies of 96% and 98% in PMI’s product range and small size is obtainable in the near future? Most likely, this will be the case. In the meantime, the additional semiconductor cost does not justify the price especially when product size, heat dissipation and minimal power losses come into play. Solar panels savings may provide a pay back within 10 to 15 years. “Green” cars are too expensive for the environmentally conscious driver who is trying to reduce costs. Homeowners expecting to get a “free ride” by putting power back into the grid will not see that “pot of gold” in the near future. Very efficient power supplies that are small and inexpensive may not be readably available next month. However, being able to cross “the threshold” and being able to buy the “NextGen” (eco-friendly) power supply may be nearer than we think. Will it be 2012? 2013? Time will tell.